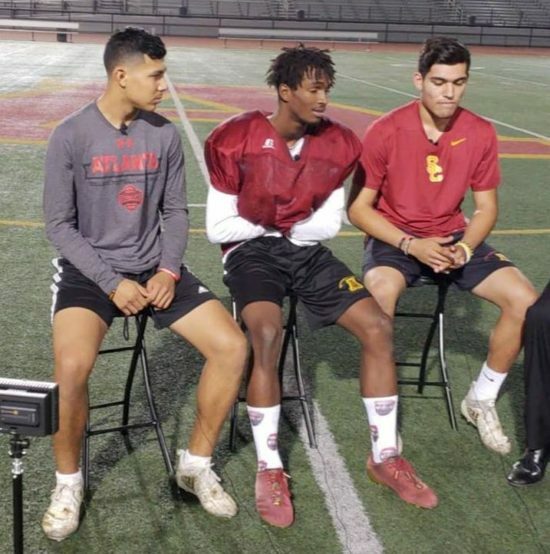 Arcadia’s (L-R) Frankie Contreras, Rolandiss Whitener and Dylan Guerra will be key components Friday night in the Division 8 Final against Kaiser. 6 Comments to "Arcadia – Kaiser by the Numbers"
That guy is an absolute beast. Don’t think I’ve ever seen that combination of relentless power and cutback ability. Maybe if the whole team (including its coaches) weren’t a bunch of chest thumping pre-madonna’s they would have won. Love it! How did that one demensional offense do?? Apaches roll, not because of their offense because of their defense. Kaiser too one dementonal and Arcadia figures them out.